Who is, “Harkalya Reveur”? Tell us a little about yourself. I am a dreamer, natural born fantasy artist, angry-loving mother of two (little demons), permaculturist, cardboard recycler and compulsive reader. Around six years ago I moved to a little andinean village called “La Azulita” (Little Blue) surrounded by tropical forests, we live in our organic farm, I love animals and care for many of them, like Noah`s ark: We have two goats, one male lamb, two cats, two dogs, two tortoises, a hen turkey, one rooster, five hens, eight chickens, a pair of guinea’s hens, two rabbits -the white girl called “Nieve” is my fav pet- and many wild fauna like birds, squirrels and others. We cultivate the most of our food and help in empowering and environmental projects with local school children and women. I am from Caracas, a dangerous and cosmopolitan city, chaotic like all my country Venezuela, the epicenter of madness, so as you can imagine living in forest mountains and farming is very different from my old academic and bohemian life and we have often funny situations because that… I think my life is a surreal experience, dreamy and nightmarish, my goal is enjoy it more than suffer it! I found it with internet, researching about contemporary fantasy art. I was amazed by the site and asked for join submitting some pieces of my portfolio, after a little time they wrote me an email accepting me, which made me so happy! One of my earlier EV, this work is so intimate, is about the big-heavy responsibility we have in hands when born a child, the pain implicated in giving and supporting another life, but is also about the wonder of life, the maximum gift God/Goddess give us every day and how we hurt each other when don’t understand that simple truth. I was in a painful situation with my partner and I channelize it through this theme. I totally exposure my deep inner feelings here. I offered my soul as a gift. 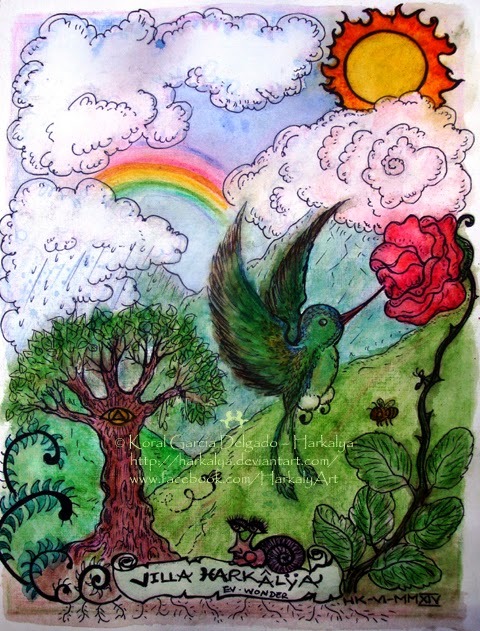 With the theme Wonder I painted a very “realistic” landscape of my farm, my friend hummingbird and my beautiful rose, there is details like the bees because they are very important to us, the avocado tree showed as a wisdom tree, that it is in fact! I tryed to show how focusing in the little-magic-fantastic-everyday-things give you the strong to support all the remain, the messed part, the ugly and sad and dark. I am trying to do it, I will certainly do more on the future, when solve some difficult with international shipping and internet at home. Every month I challenge myself to give my best and try to do it on time because I respect and admire a lot the art of my fellows and I am so proud to be part of this collective, is like I found my soul family. It is absolutely inspiring. I can`t wait to see what other artists had created for each theme, is amazing to see all works together, I spend hours looking into each piece. Currently my studio is everywhere I am, lap, kitchen, room, outdoors, any table, etc… also finally after years wishing for, I have my own space for workshop but… right now is like a storage room and definitively needs more natural light… I am planning this will be a place for art classes, working and a community library for people –children- around my home. Thank you so much Koral, for this wonderful look into your creative process, your art and you. 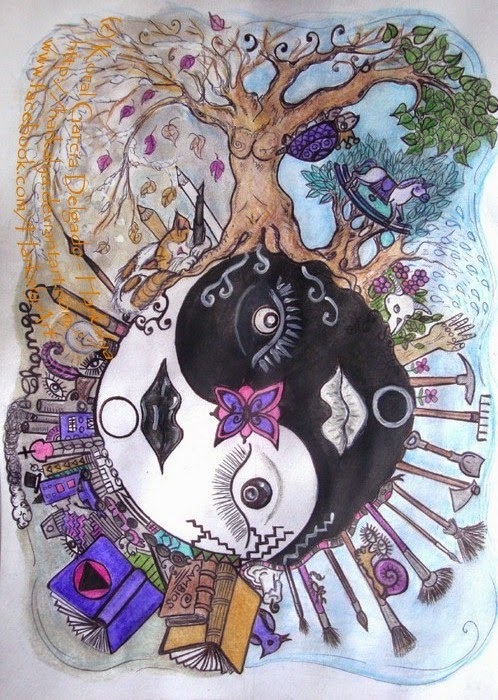 Please visit ENCHANTED VISIONS to see more of Koral’s art and what she has created for the latest theme. 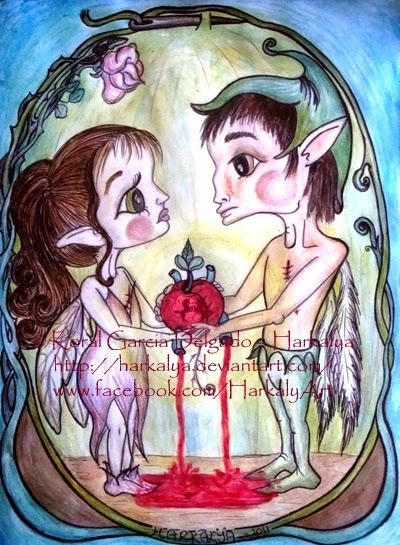 Posted in artist feature, artist interview, Enchanted Visions, Friday Art Feature and tagged fantasy art, Harkalya Reveur, Koral Garcia Delgado.